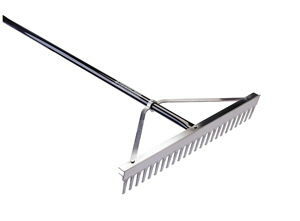 36" lightweight rake with tines on 1 side and flat grading blade on top. Great to use after thatching lawns for quick clean up or grading added topsoil to lawns or beds. * Please call us for any questions on our rakes landscape rentals in Portland OR, Gresham OR, Milwaukee OR, and surrounding metro area.